Adam Basma Music & Dance Company is based in Los Angeles, California, U.S.A., and has performed for concerts, Weddings, parties and special events since 1973. The Founder and Artistic Director is Adam Basma. He has researched Middle Eastern folkloric music, dance, costumes and traditions by traveling, residing and studying in many different countries, such as Egypt, Lebanon, Syria, Saudi Arabia, Kuwait, Bahrain, and The United Arab of Emirates. Adam has been performing as a dancer since childhood starting in Lebanon, the touring The United States, the Arabian Gulf, Europe and the rest of the Middle East. This company has 25 dancers and 6 musicians and one DJ. Adam's company is constantly striving to provide entertainment in an exciting and artistic manner, and is dedicated to promoting, preserving and teaching Middle Eastern music and dance to the American audience as well as the Arabic community. Through music and dance, they try to educate Americans about the fascinating traditions and artistry of this culture. With the constant support and pride of the Arabic people, their endeavors have been quite rewarding. Under the direction of Artistic Director and Choreographer Adam Basma, the company brings to life on stage the rich tapestry of color, music and history of traditional folk and native dances of Egypt, Lebanon, Syria, Palestine, Jordan, The Arabian Gulf, Iraq, Morocco and Algeria. 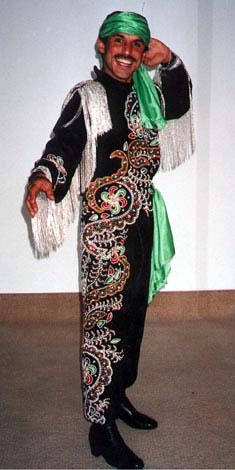 The Company, formed in 1980, began with the mission of teaching and educating the American public on the traditional art of folk style of the Middle Eastern Dancing. Adam has received international acclaim for his precise attention to detail, technique and structure of each dance performed from the many regions of the Middle East. Acknowledging the importance of authenticity in art, Adam has also collected the largest and most diverse selection of traditional attire and props available today; many of the pieces being over 100 years old. The Company has grown to include 30 highly trained dancers and musicians presenting an electrifying production that showcases the ancient rituals of Middle Eastern dances. Having toured throughout the United States and Europe, the company has performed for hundreds of international dignitaries, at premier events, and at concert halls including the Middle Eastern Royal Families. 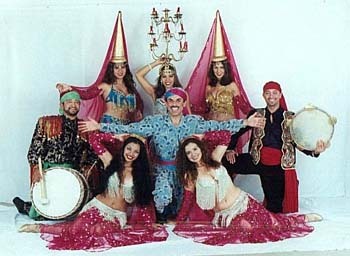 The Adam Basma Middle Eastern Dance Company has earned a reputation for being the best ensemble troupe to represent the true art of Middle Eastern dance in the United States to date. Adam was born in Beirut, Lebanon and began his dancing career in the early 70's. He studied with some of the great masters of Traditional Middle Eastern Dance, including director of the Al Anwar Lebanese Dance Troupe Badiaha Jarrar. Adam has performed with numerous legendary singers including the infamous Dive Sabah. In 1973, the Lebanese Government sent Adam to tour the United States representing Lebanon through dance. Adam graduated from the University of Texas and was asked to choreograph and perform a twenty-two minute dance piece to a narrative depicting the Lebanese Civil War. This piece was one of the firsts of its kind in the US receiving critical acclaim and national notoriety for interpretation and performance. Adam has worked on numerous films and television including Protocol, Staring Goldie Hawn, as artistic director and choreographer for scenes featuring Arabic dances and attire. Adam has built a strong solo career and dance company, both having critical acclaim making it the number one dance company in the United States. Adam continues to teach the art of Middle Eastern Dance to hundreds of students annually. He also leads tours and periodically returns to the Middle East to study new and ancient techniques. His performances and his dedication to Middle Eastern Dance have set him apart as one of the leading male dancers and dance companies in our country today.